Flavonoids are water-soluble antioxidants in fruits, vegetables, tea and wine. Colourful pigments, they are responsible for brilliant blues, purples and greens, as well as yellows, oranges and reds which cannot be attributed to carotenoids. Research links them to reduced risks to our overall well-being, as well as antioxidant protection of body fluids. GNLD’s Flavonoid Complex provides diverse phytonutrients from an optimal serving of fruits and vegetables, plus catechins from green tea and ellagic acid from grapes, cranberries and other berries. Research links diets abundant in flavonoid-rich fruits, vegetables, tea and wine with reduced risks to overall well-being. As water-soluble antioxidants, flavonoids help protect body fluids from oxidation. Flavonoids promote optimal well-being in ways distinct from the actions of other dietary factors. Broad-spectrum, water-soluble nutrient supplementation. 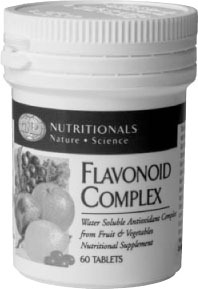 Flavonoid Complex contains flavonoids representative of all flavonoid classes - flavones, flavanols, flavanones, anthocyanins and catechins - as they naturally occur in human-food-chain fruits and vegetables. Whole-food ingredients. Our exclusive blend of flavonoid-rich extracts and concentrates is derived from whole cranberries, kale, green tea (decaffeinated), beets, elderberries, raspberries, blueberries, red and black grapes, oranges, lemons and grapefruit. Added naturally occurring vitamin C enhances absorption. Laboratory-specified amounts of key flavonoids. Flavonoid Complex has been tested to confirm the presence of specific flavonoids for which substantial research demonstrates benefits. Delivers ellagic acid. Closely related to the flavonoid “family,” ellagic acid is an antioxidant phytonutrient found in strawberries, cranberries, grapes, raspberries, etc. Green tea extract. Hundreds of clinical studies show green tea flavonoids, missing in many diets, may benefit well-being. No artificial colours, flavours, preservatives, or sweeteners. Convenient serving. Each tablet provides the phytonutrient value of an optimal serving of flavonoid- rich fruits and vegetables - just one more way you can meet the recommended daily intake of 5 to 9 servings of fruits and vegetables every day.